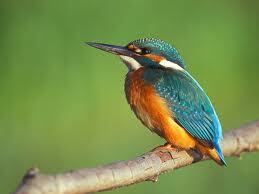 Why do you think kingfishers were given their name? If you guessed because they’re expert fishermen, you’re right. 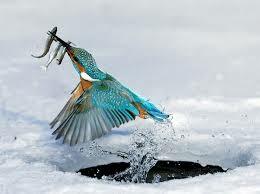 Kingfishers eat fish and crayfish. They live in burrows on the edges of streams, lakes and ponds. To catch fish, they lazily fly over the water, swooping down to spear a fish with their sharp beaks. Sometimes they perch in a branch near a river and dive when they see a fish. One thing you should know all about kingfishers – they’re expert fishermen. Kingfishers eat fish and crayfish. They live in burrows on the edges of streams, lakes and ponds. The banded kingfisher is the most common species in America. It has grayish-blue feathers with a band of rust-colored feathers on its chest. In other parts of the world, kingfishers are often brilliant blue with orange chests. To catch fish, they lazily fly over the water, swooping down to spear a fish with their sharp beaks. Kingfishers have a hard beak like a dagger for spearing fish. Female kingfishers are more colorful than males. Kingfishers make dry, loud screeching sounds. In the winter, kingfishers migrate to areas where the water is not frozen. A pair of kingfishers work together to build burrows along the edges of streams or rivers. A borrow might be 3 to 8 feet long. A male kingfisher. Female kingfishers are more colorful than males. A slow motion video of a kingfisher catching fish. 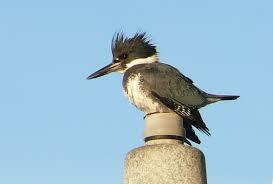 Question: What do baby kingfishers eat? Answer: Baby kingfishers eat fish. Their stomachs contain acid to dissolve bones, skin and scales. Question: How big are kingfishers? Answer: Most kingfishers are about 13 inches long – larger than a robin, but a bit smaller than a seagull. Enjoyed the Easy Science for Kids Website all about Kingfishers info? Take the FREE & fun Kingfishers quiz and download FREE Kingfishers worksheet for kids. For lengthy info click here. Declan, Tobin. " Kingfisher Fun Facts for Kids ." Easy Science for Kids, Apr 2019. Web. 26 Apr 2019. < https://easyscienceforkids.com/all-about-kingfishers/ >.